It only seems like yesterday that the first Bass[sic] party kicked off in a sweaty basement in Shoreditch. Fresh faced & wet behind the ears residents Hubie, rejectbeats and Big Nick D pushed the soundsystem to the max along side our first ever guests Peo de Pitte and The101Connection. We are all a year older now, crow’s feet & grey hair have made an appearance, but the Bass[sic] vibe is still in full effect. Come and join us for a first birthday of epic proportions. We’ve secured drinks deals, world class guest DJs and a late licence, so put on your dancing shoes and help us celebrate for free until 4am. We advise you get to The Cornershop early as it’s gonna be rammed! * Special Late Licence – 8pm-4am – FREE Entry! * Exclusive drinks specials at the downstairs bar! * NAPT [Fool’s Gold / Red Sugar] – Fuelled by low end dynamics, stylish production and powerful beats our first guest’s imaginative musical vision has seen them win prestigious dance awards, top charts and become supported by the some of the world’s top selectors including Annie Mac, A-Trak, Crookers, Laidback Luke, Dillon Francis and Steve Aoki. With releases on A-Trak and Nick Catchdub’s Fool’s Gold, Herve’s Cheap Thrills, AC Slater’s Party Like Us, La Bombe and their very own imprint Red Sugar Records, 2012 has been a fantastic year for NAPT. * NORMSKI [Hoxton FM / Get Tronic] – For our second guest we have a very exciting birthday treat. Not only is he a leading authority on urban and contemporary culture, has had a prolific career in the field of music, television, photography, fashion and journalism, but he’s also a party rocking DJ of the highest calibre. Normski has been the face of many TV shows on BBC2, ITV & Channel 4 but now you can catch him behind the decks at Bass[sic] spinning his brand of turbo charged techy beats. Be sure to catch his weekly radio show, Get Tronic every Friday on Hoxton FM. * HEDSTATE [Big Square Records] – As an added birthday bonus we have a third guest this month, the Hedstate DJs. A loose collective of producers & DJs, these open minded, forward thinking northerners will grace the Bass[sic] control booth & wow you with their eclectic tune selection. We hope you can join us in the rave cave, downstairs at The Cornershop! Since it’s our birthday we’ve secured a special LATE LICENCE, staying open ’til 4am, and some exclusive DRINKS SPECIALS at the downstairs bar only, so please take advantage of them! Once again, entry to this party is FREE all night long and, considering the heavy lineup, we’re expecting the venue to be rammed so make sure you get down there nice and early to avoid disappointment! 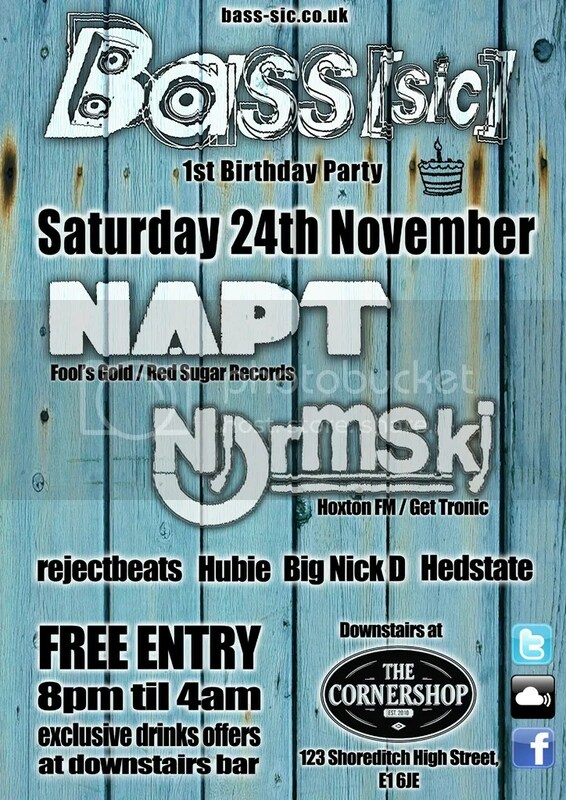 Posted on 21/10/2012, in Events and tagged bass, basssic, birthday, breaks, foolsgold, house, hoxtonfm, london, napt, normski, november, shoreditch, techno, thecornershop. Bookmark the permalink. Leave a comment.